What did the Ninevites do when they heard Jonah's message? Grave challenges confront the United States and the entire Free World. Here is a rundown of what to expect. This is no "Happy New Year" for leaders in Washington and other Free World capitals. 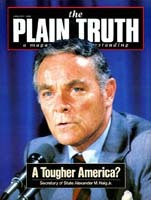 On many widely scattered fronts, the challenges ahead will be great, especially for President Ronald Reagan, Secretary of State Alexander M. Haig Jr. (see cover) and others in the Reagan administration.